This morning I woke up with an odd sensation in the back of my head. I kissed Gary and went downstairs, put on the water for tea and crept into Lauren’s dark, cool room. “Thumbs up for eggs,” I said and watched a sleepy thumb emerge from the covers. A few minutes later, Lauren came into the kitchen sleepy but smiling. I, on the other hand, was gripped with an inexplicable pain. I whisked the eggs and put some toast down, my body suddenly bathed in sweat. The eggs went on the plate, some milk in a glass, and me collapsed on the couch. Gary brought me a huge bowl, the only one in the house, in case I barfed. he then reminded me that Lauren’s uniform needed a button. I felt so weak that the thought of lifting a needle seemed impossible. The next thing I knew, Gary was attempting to do it himself which would be sort of like me teaching a class in auto mechanics. He then set off to make Lauren’s sandwich, accidentally spreading yesterday’s leftover oatmeal on a piece of bread instead of the tuna salad I had planned for her. Lauren eventually scrambled to the bus, and my mysterious illness passed as quickly as it had come. An hour or so later, Gary and I were out the door, shopping list in hand to prep for our weekend visitors. 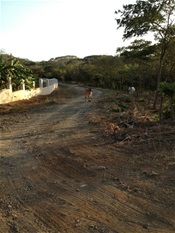 We had about an hour before we had to return the rental car to avoid additional charges and flew to the store, my stomach heaving with each lurch of the vehicle, eyes peeled for cows that seem to wonder these roads at liberty. At the grocery store, I heard my name called. It was our friend Chad who bears a striking resemblance to our other friend, Jeff. We met Chad when we were here the last time. Gary became a member of the AutoMercado savers club, an irony since in the States he is a budget buster at the grocery store.